In Britain there is a standard for tactile paving at the start and end of shared-use foot / cycling paths. It uses a short section of ridged paving slabs which can be laid with the ridges either along the direction of the path or across the direction of the path, to indicate which side is reserved for which mode of transport. If you have small hard wheels, like many pushchairs or the front castors on many wheelchairs, transverse ridges are very bumpy and uncomfortable. If you have large pneumatic wheels, like a bike, the wheel can ride over the ridges so it doesn't feel the bumps. If you have two wheels and the ground is a bit slippery, longitudinal ridges can have a tramline effect which disrupts you steering and therefore balance, so they are less safe. If you have four wheels, the tramline effect can't disrupt your balance and can be nice and smooth. 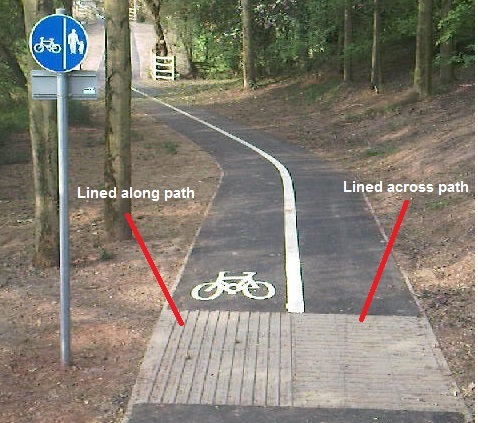 So obviously the standard is transverse ridges for the footway, and longitudinal ridges for the cycleway.